Adam argues that the age old business strategy focused on efficiency at scale can become your biggest enemy, the moment the future becomes unpredictable (as it more and more does nowadays). Since efficiency, by design, lock in roles, processes and practices and therefore makes it much harder to change. An alternative paradigm, more suited to an unpredictable future, is one of responsiveness – being nimble and agile in responding to the changing reality. The challenge of switching from efficiency to responsiveness is a cultural one. 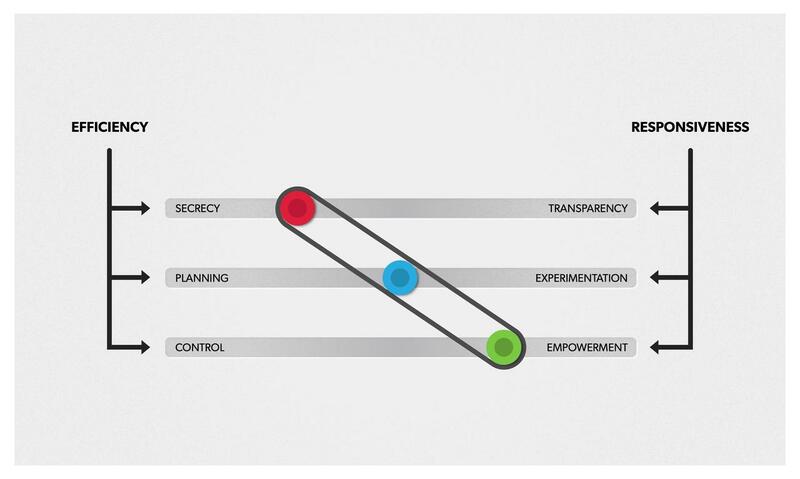 Switching from a model based on secrecy, planning and control, to one based on transparency, experimentation and empowerment. The problem gets conflated because those cultural attributes are interrelated: they can be described as “sliders” on these three spectrum, bound together by a rubber band. In order to move one of them in a certain direction, you have to move the others. He then goes on to illustrate the tension with a few real world examples. And outlines the path for transformation. Alfred takes us 80 years into the past, to Ronald Coase‘s “The Nature of The Firm” and the two fundamental problems that it outlines in organizing economic activity: motivation (getting people to expend effort, companies to allocate resources to an activity) and coordination (arranging activities so that they fit together, such as making sure a part needed for production arrives on time). There is an inherent trade-off between the two, also reflected Pisoni’s piece (control vs. empowerment is the most notable one). Alfred’s key point that this trade-off can be reduced (but not eliminate) through technology. For example, the evolution from a hub-and-spoke communication structure to a fully-mesh one enabled end-points to make informed decision without having to rely on a central decision-maker – better coordination without forcing a hit to motivation. Now according to Pisoni’s all of that doesn’t matter, since responsiveness trumps efficiency. I (and others) however, are in a camp that believes that successful companies need to have both. More on that in the next post.